What can I say, I am married to a rather strange man. Like some other strange people, my husband eats with his eyes first. Even the most fantastically tasting food is not likely to receive his appreciation if the appearance does not get his attention. In other words, for him it has to look good to taste good. 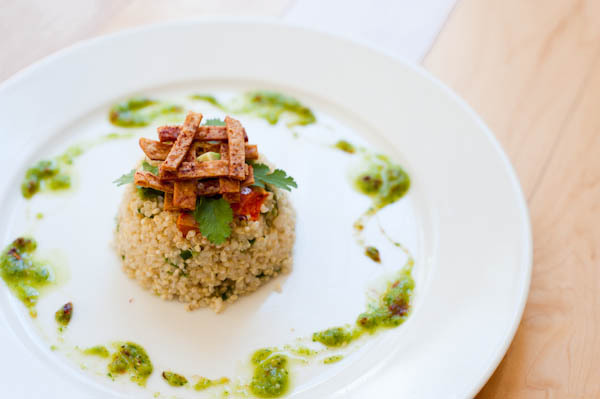 Inspiration for making this Quinoa, Avocado, and Sweet Potato Timbale came to me a few weeks ago at Charlie Palmer’s Dry Creek Kitchen. Every plate at this trendy restaurant played on unexpected textures and flavors, and was assembled with fine architectural precision, looking less like food and more like a museum of modern art masterpiece. 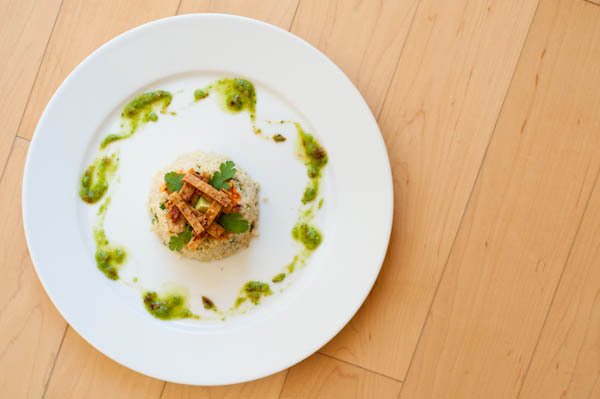 My first attempt at creative plating and food styling, Quinoa Timbale definitely passes for something that came out of Dry Creek Kitchen. Very pretty and very edible, this dish impressed the heck out of my dear husband! 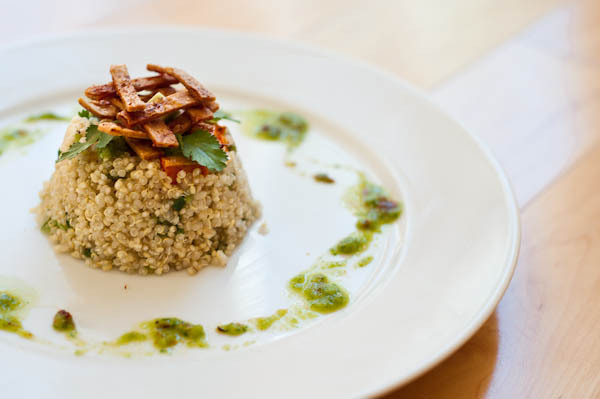 In a medium bowl place quinoa, jalapeño, 2 tablespoon cilantro, 2 tablespoon extra-virgin olive oil, lime juice, and salt and pepper to taste, and toss to combine. Lower the oven temperature to 350 degrees. In a small bowl, toss the tomatillos with 2 teaspoon of olive oil. Place on a baking sheet and roast for 15 minutes. 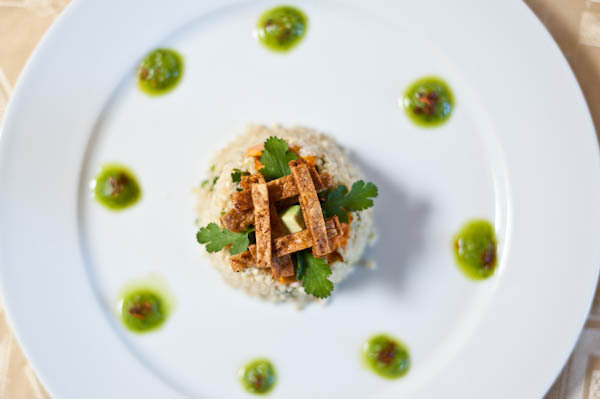 Transfer to a food processor, add the vinegar, 1/2 cup cilantro, and agave nectar, and pulse to combine. With the motor running, pour in the remaining 3 tablespoons olive oil in a thin stream. Continue blending until emulsified. Season with salt and pepper to taste. Pour 2 inches of canola oil into a small, heavy pot and heat until the oil shimmers. Add the tortilla strips and fry until crisp and browned, 1 to 2 minutes. Drain on paper towels and sprinkle with Cajun seasoning. If you want to reduce amount of fat, you can bake tortilla strips instead. 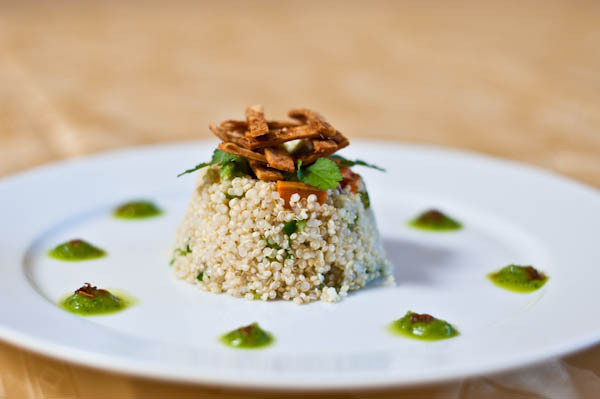 A fruity Paul Dolan Vineyards Sauvignon Blanc has a strong body, which allows it to work well with this Quinoa Timbale. Wow, what a beautiful dish! It looks so gourmet and fancy. I’m cooking it this weekend for sure. I’ve bookmarked http://cuceesprouts.com/2011/02/quinoa-avocado-and-sweet-potato-timbale/ at Digg.com so my friends can see it too. I used Quinoa, Avocado, and Sweet Potato Timbale With Roasted Tomatillo Dressing so it was a good title.